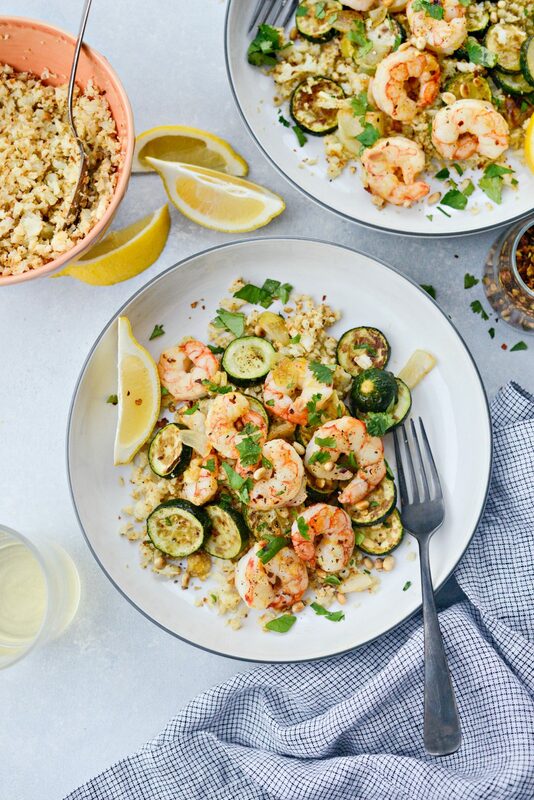 In this Sheet Pan Lemon Garlic Shrimp and Zucchini tender shrimp is tossed with lemon zest and fresh garlic roasted with fresh zucchini and yellow onions. 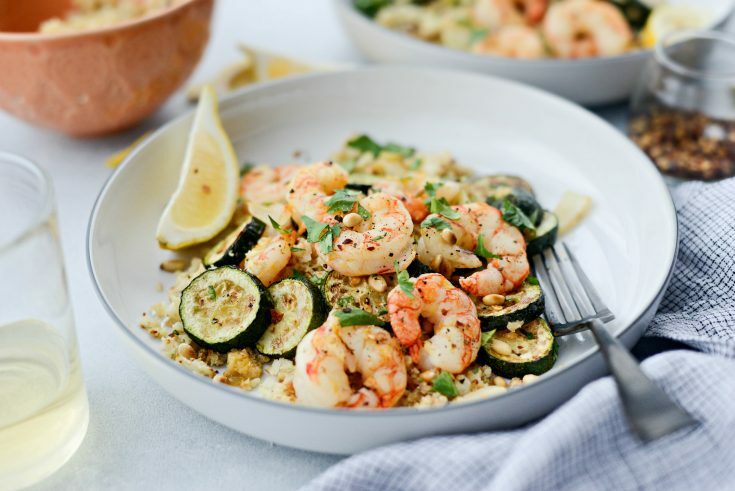 Delicious paired with cauliflower rice, making for a light, healthy meal. 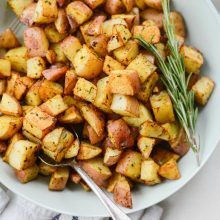 Serves 4 in 20 minutes and is also great for meal prepping! 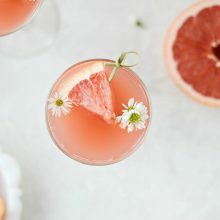 I’ve got yet another easy recipe for you! 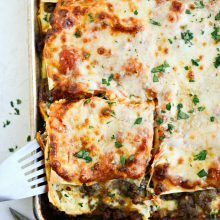 I’m super excited to share this recipe because a) it’s a sheet pan recipe and b) it takes 20 minutes.!!! Although I should be figuring out my instant pot (why am I procrastinating?) I’m definitely still loving these delicious one pan jams. 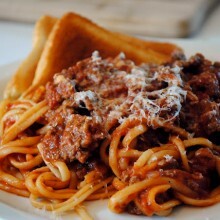 This one in particular only has a handful of ingredients and is so easy to prepare and cook and bonus! it’s also great for meal prepping for the week! I made this on Monday when we were snowed in. It’s the eighth snow day and my girls have been off from school all week long. It started on Monday we got 6 inches of snow and now it’s currently -30° with the windchill. Just looking outside I can tell it’s super cold and I wish I didn’t have to go out today, but someone has a dentist appointment and I also need to stop for gas. 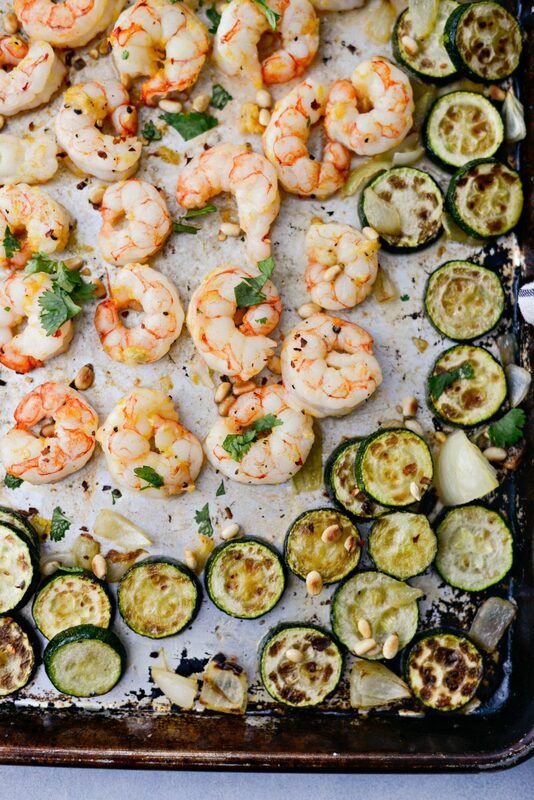 Luckily for me, I still have some of this sheet pan lemon garlic shrimp and zucchini leftover. 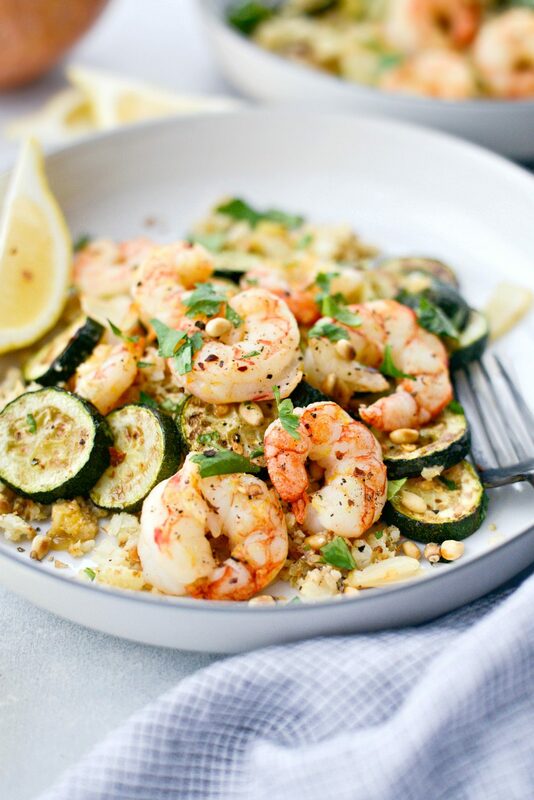 Here’s what you will need: olive oil spray, 3 zucchinis, 1 small yellow onion, 1 pound peeled and deveined shrimp*, zest of 1 small lemon (reserving 1/2 the lemon), 2 to 4 cloves of garlic, 1 teaspoon light olive oil, kosher salt and freshly ground black pepper and toasted pine nuts. *Purchasing shrimp with tails on or off is up to you. However, if you buy shrimp already deveined, double check each one that the digestive track has actually been removed. Although the package states the shrimp has been deveined, that’s not always the case. In the past, I’ve found a few with them still intact. You will see a dark grey/black line along the back of the shrimp. Use a paring knife to make a shallow cut along the back of the shrimp, remove the digestive tract and rinse the shrimp under cool water. Next, preheat your oven to 475° and spray a rimmed metal baking sheet with olive oil. 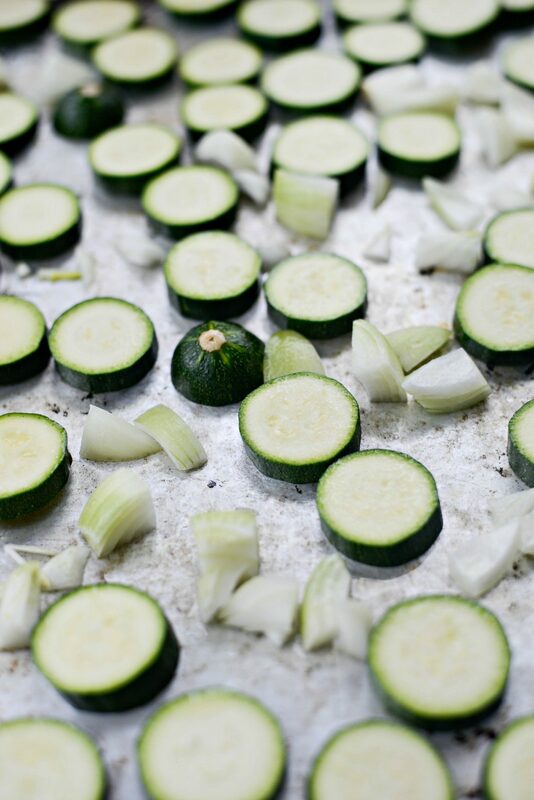 Then scatter the sliced zucchini and chopped onion. Spray one last time with olive oil and season with kosher salt before roasting on the bottom rack of your preheated oven for 8 minutes. Meanwhile, toss the 1 pound of shrimp (thawed if previously frozen and patted dry) with 1 teaspoon light olive oil, lemon zest, grated fresh garlic, kosher salt and black pepper. If you’re using thawed shrimp, pat dry before tossing with the other ingredients. Once the zucchini has roasted, use a spatula to turn them over and then scoot to the parameter of the pan. Immediately add the shrimp and arrange in uneven layer. 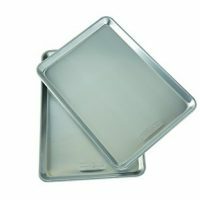 Return the pan to the oven and roast for 6 to 8 minutes or until opaque and fully cooked. 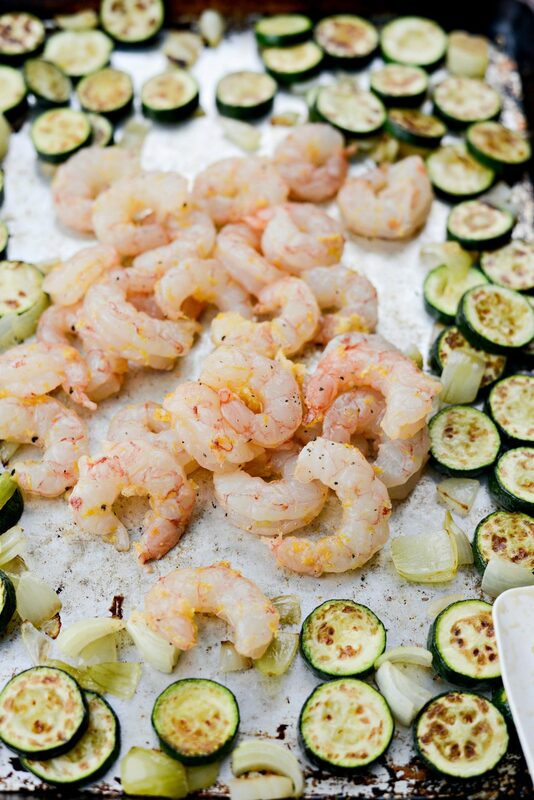 Once roasted, remove the pan and squeeze 1/2 of a lemon overtop of the shrimp and zucchini. Top with chopped fresh cilantro (or parsley), toasted pine nuts and red pepper flakes (optional), giving one last toss to combine. Lastly, divide among 4 plates. I served it with roasted cauliflower rice and a wedge of lemon. Because in my world there’s no such thing as too much lemon. 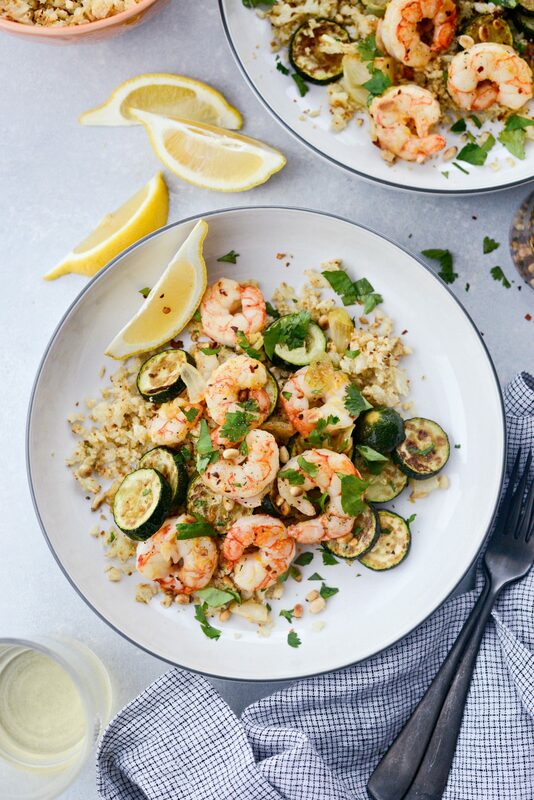 If you love garlic, lemon and shrimp then you will definitely love this recipe as well! Enjoy! 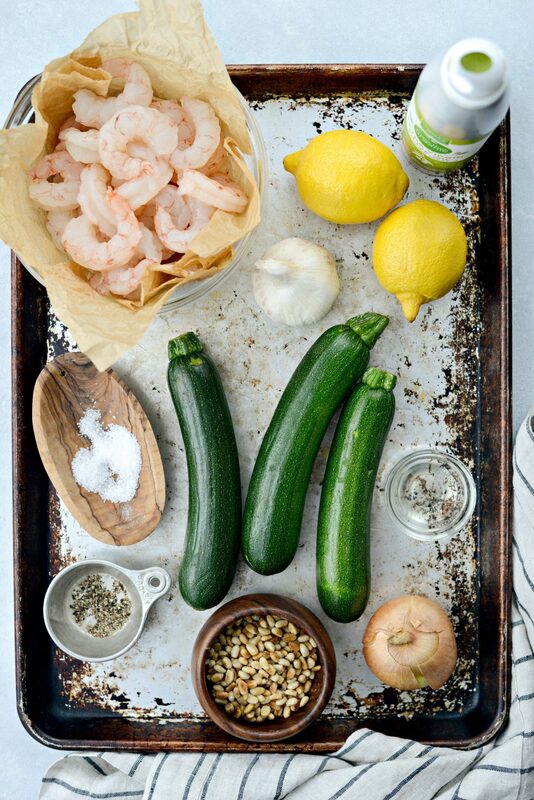 And if you give this Sheet Pan Lemon Garlic Shrimp and Zucchini recipe a try, let me know! Snap a photo and tag me on twitter or instagram! 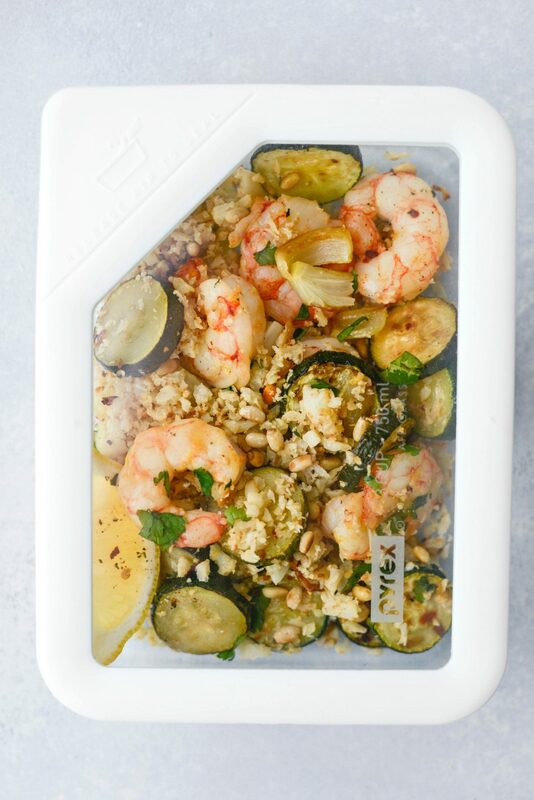 In this Sheet Pan Lemon Garlic Shrimp and Zucchini tender shrimp is tossed with lemon zest and fresh garlic roasted with fresh zucchini and yellow onions. 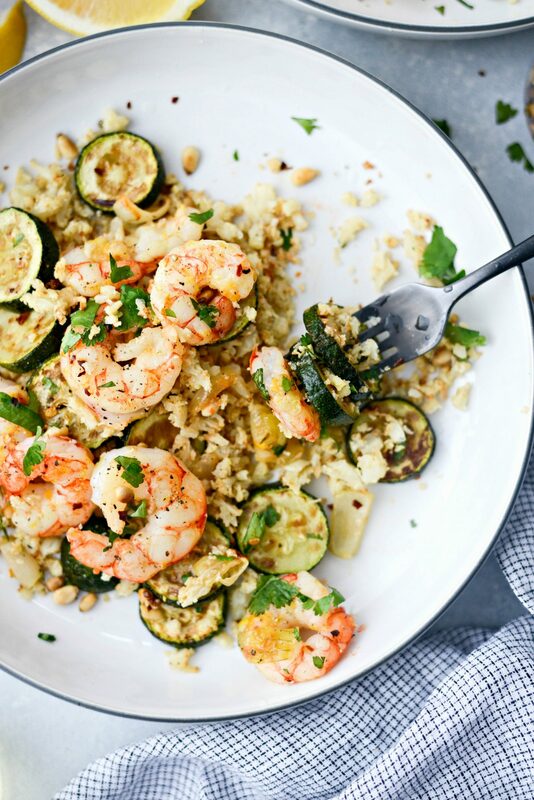 Delicious paired with cauliflower rice, making for a light, healthy meal. Also great for meal prepping! 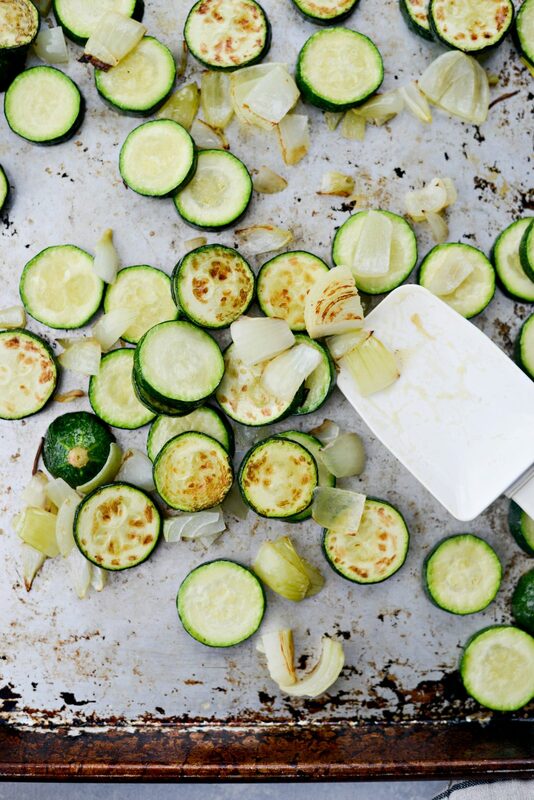 Spray a rimmed, metal baking sheet with olive oil and scatter the zucchini and onions in an even layer. Spray one last time and season with a couple pinches of kosher salt. Roast on the bottom rack of your preheated oven for 8 minutes, rotating the pan halfway through cooking. 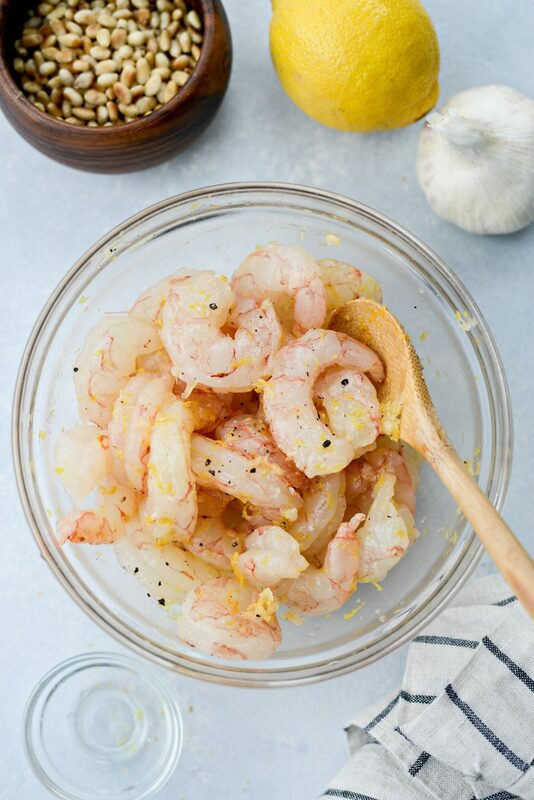 Meanwhile, toss the shrimp with 1 teaspoon olive oil, lemon zest, garlic, a pinch or two of kosher salt and freshly ground black pepper. 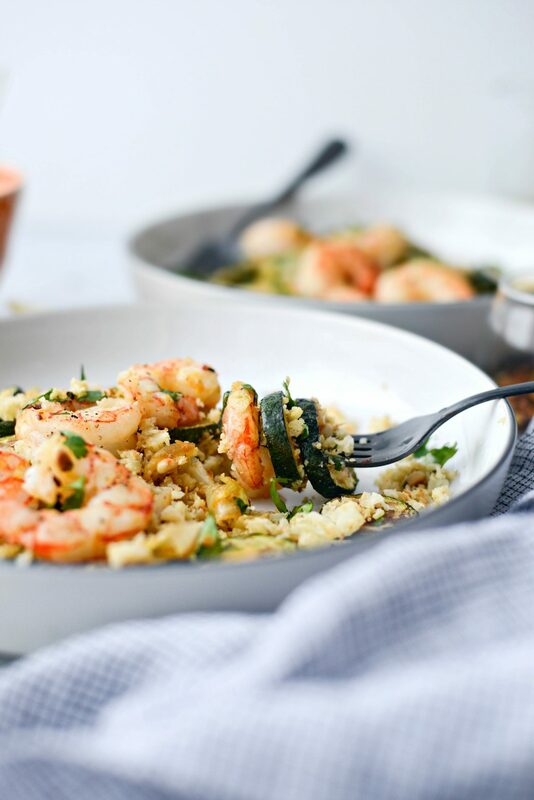 Once the zucchini is roasted, remove the pan and flip the zucchinis, pushing them to the outside of the pan before arranging the shrimp in an even layer in the center. Roast the shrimp for 6 to 8 minutes, or until opaque and fully cooked. 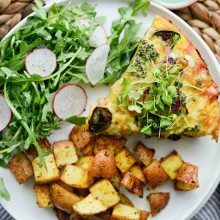 Squeeze half of a lemon over top and sprinkle with toasted pine nut, chopped fresh cilantro (or parsley) and red pepper flakes if using. 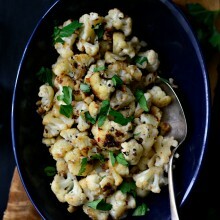 Serve with cauliflower, brown or white rice. If using previously frozen shrimp that has been thawed, pat dry before tossing with the other ingredients. Please please start investigating your InstantPot!! 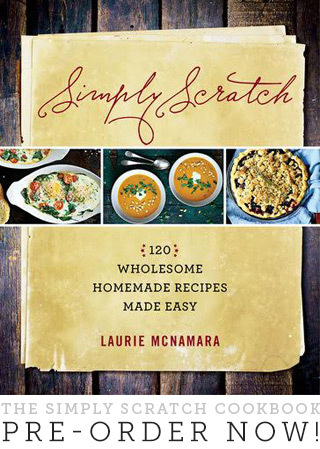 I have been waiting on you to make some recipes. Yay!! Gah! I know, I’m so behind on this!